tasija Sevastova of Latvia 6-2, 6-3 today in the U.S. Open quarterfinals. The heat and a tough opponent got to Roger Federer on Monday night. The same thing appeared to happen to Sloane Stephens today. On another sweltering day in New York, No. 19 seed Anastasija Sevastova of Latvia ousted No. 3 and defending champion Sloane Stephens 6-2, 6-3 in the U.S. Open to reach her first Grand Slam semifinal. The men's defending champion, Rafael Nadal, almost lost, too. The No. 1-seeded Nadal edged No. 9 Dominic Thiem of Austria 0-6, 6-4, 7-5, 6-7 (4), 7-6 (5) in a battle that ended at 2:04 a.m. EDT Wednesday. At four hours, 49 minutes, it's the longest match of the tournament. Thiem sailed an overhead way long on Nadal's first match point in a rematch of the French Open final in June, won by the Spaniard 6-4, 6-3, 6-2. Sevastova, 28, improved to 2-2 against Stephens, a 25-year-old Fresno product. Stephens had won 6-2, 6-2 in the Montreal quarterfinals early last month and 6-3, 3-6, 7-6 (4) in the U.S. Open quarters last year. It was the second consecutive year that Sevastova, who retired in 2013 because of injuries but returned in 2015, had reached the quarters in Flushing Meadows. 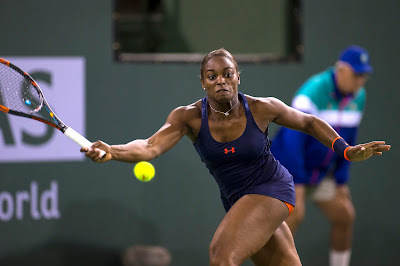 Stephens kneeled in fatigue several times between points during today's match, while Sevastova appeared to be fresh. Both players committed 28 unforced errors, but Sevastova had 18 winners, including an unofficial eight on diabolical drop shots, to Stephens' 13. "It was just really hot," Stephens told reporters. "You can't control the weather, can't control what the tournament is going to do. You just have to go with it. It was hot for both of us. She handled it better." Stephens added that she has been suffering from a "bad sinus infection" since Monday. Sevastova, who also defeated No. 7 seed Elina Svitolina in the fourth round, will meet No. 17 seed Serena Williams, a part-time resident of Silicon Valley, for the first time on Thursday. Williams avenged a loss to Karolina Pliskova of the Czech Republic in the 2016 U.S. Open semifinals, beating the No. 8 seed 6-4, 6-3. Williams is trying to win the U.S. Open for the first time in four years and equal Margaret Court's record of 24 Grand Slam singles titles. Nadal, who needed 4:23 to subdue rising star Karen Khachanov of Russia in the third round and 3:19 to beat Nikoloz Basilashvili of Georgia in the fourth round, could face his fourth consecutive long match when he plays No. 3 seed Juan Martin del Potro in Friday's semifinals. Del Potro, who has had four wrist operations since winning the 2009 U.S. Open, subdued No. 11 John Isner 6-7 (5), 6-3, 7-6 (4), 6-2 in three hours, 31 minutes. Nadal, 32, is 11-5 against del Potro, who will turn 30 on Sept. 23. In their last meeting, Nadal prevailed 7-5, 6-7 (7), 4-6, 6-4, 6-4 in four hours, 28 minutes in the Wimbledon quarterfinals in July. In the second round of boys singles today, Jenson Brooksby of Carmichael in the Sacramento area dominated Jonas Forejtek of the Czech Republic 6-1, 6-2 in 71 minutes. Brooksby, 17, will play Switzerland's Henry Von Der Schulenburg, who defeated Trey Hilderbrand of San Antonio 6-4, 6-4. Brooksby won the USTA Boys 18 National Championships last month to earn an automatic wild card into the men's main draw of the U.S. Open. He lost to John Millman 6-4, 6-2, 6-0 in the opening round. Millman went on to stun Federer. --Natasha Subhash of Fairfax, Va., in the Washington, D.C., area and Katie Volynets of Walnut Creek in the San Francisco Bay Area surprised No. 2 seeds Eleonara Molinaro of Luxembourg and Xiyu Wang of China 6-2, 5-7 [10-2]. --No. 3 seeds Hugo Gaston and Clement Tabur of France defeated Brooksby and Stefan Dostanic of Irvine in the Los Angeles region 6-4, 6-2.